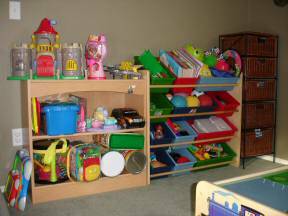 It’s time for the after Christmas project – to organize toys. Even though we insisted there would be less toys for Christmas this year because last year looked like a toy store exploded in our living room, there were still just as many, or more. How do we let this happen? I mean, we all mean well and get so excited to see the kids full of joy. But, really, the kids get overwhelmed and can’t or don’t play with everything anyway. Next year, I swear, it will be a smaller Christmas! Really. Despite the fact that we purged several toys before the holiday to make room for the new stuff, we were still very short on space. My mission after the holidays were over was to find a place for everything. 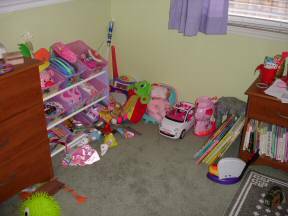 Here is my short story along with before and after pictures of the toy room and my daughter’s bedroom. One section of wall in the family room houses a bunch of toys. 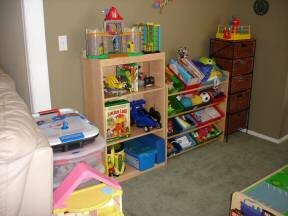 But who am I kidding, by calling this a family room… it’s the toy room. Anyway, it’s pretty neatly organized, but I had to find a home for all the new toys. There is also a train table that lives in front of all these toy storage bins. 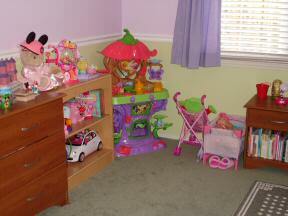 This is my daughter’s bedroom before I went to organize toys in her room. See the large section of wall space being poorly used? Looks like we need to store upwards! The biggest change was in my daughter’s bedroom. I put the old book shelf from the toy room into her bedroom to help store her new toys. I had to slide her dresser down a bit, but for now, it all works out just fine. The bigger issue I had was to find a home for her brand new Tinker Bell Café! It’s terribly cute, but takes up quite a bit of space. But you can see here, that everything now has a place to be. 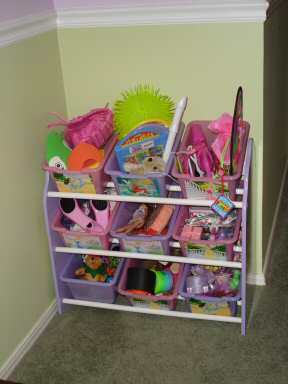 Where did I put that cute little toy bin organizer she had? I had to move it to another part of her bedroom. It fits perfectly on this short wall. This seems to be working for right now. I truly think that we still have way too many toys and that hopefully over some time, we’ll be able to let more of the toys go and reclaim back some of that wall space. Just because there is floor and wall space doesn’t mean we need to fill it with stuff! A home is so much more peaceful and relaxing without furniture and toys stuffing every inch of it. As for my son’s room, we didn’t have much to put into his room after the holidays. The problem there is a new student desk that we made room for. One wall is a little tight with stuff, but I hope that we can get rid of some of it in due time. What did I learn from this project to organize toys? That we must continue to declutter. That we must give everything a space to live in or it’s going to live on the floor making a mess. That we need to be opened to moving things around until we find something that works for us. And then we need to declutter some more!